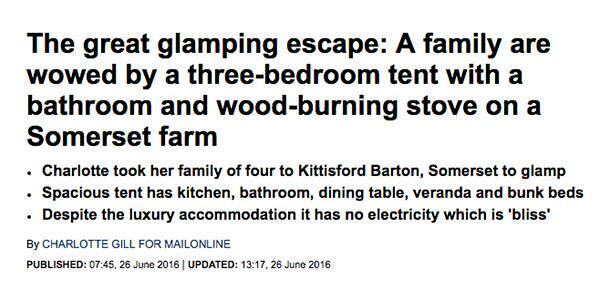 Kittisford Barton was recently featured on the Mail Online, receiving excellent reviews from Charlotte Gill who brought her family along to stay with us for a weekend. “Lantern and Larks combines the best bits of camping (switching off from the real world and enjoying the outdoors) without the worst bits (bickering while you try to put up the tent and huddling under a leaking roof). Or book to stay at one of our sites for yourself by checking availability here. Cover photo courtesy of Charlotte Gill.